My dad used to make the tartest, most sugary lemonade of all time. The kind where your lips would pucker and you’d slightly wince after every sip. But it was so sweet that I kept going back for another drink. By the time I was done, my tongue was raw and I could probably feel a cavity coming on if I wasn’t in the midst of a maniacal sugar-high. Whenever I would open the fridge and see that pitcher of lemonade I felt so conflicted. Did I want to endure the headaches that came from wincing and puckering so hard? Being the sassy little sugar-fiend that I was, though, I could never resist. By the time I was old enough to realize I could resist the temptation of that lemonade I was a young college girl in her early twenties and on her own for the first time (last year, basically). After moving out, I lost the desire to ever drink lemonade again. “That overly sugary lemon concoction will never again touch my lips,” I dramatically thought to myself. It lasted until I was about 30 (I mean, er… uh, 21?) and I discovered the sugar-free lemonade at none other than the LA eatery, Lemonade. After finding that delight, I found myself having occasional lemonade cravings. Recently, I began making smoothies with lemonade and fruit and I have to say, it is my new favorite thing. I know that my body does not handle sugar very well (who can blame it after my childhood addiction?) so I do my best to make smarter choices when it comes to sweeteners when I can. I use xylitol, coconut sugar, coconut nectar, brown rice syrup, and other liquid sweeteners, but what I use most frequently is stevia. I add a little to my morning oatmeal, my smoothies, my tea, and I sometimes even bake with it. One of my favorite brands is NuNaturals because their stevia has a clean, simple flavor with no aftertaste and their powdered stevia does not clump when you add it to liquids. They also have a variety of other sweeteners, some of which I’ve reviewed before. Recently, NuNaturals came out with a variety of flavored liquid stevias, similar to their vanilla stevia, and they were kind enough to send me some to sample. So far, I’ve tried the Orange, the Cherry, and the Cherry Vanilla, but so far my favorite has been the Lemon Stevia. I’ve added it to my tea, granola, and now this Mango Lemonade Smoothie to help impart a stronger lemon flavor. I tasted the smoothie before and after I added it and I was amazed at how much of a lemon flavor it imparted. I also added to the smoothie a teaspoon of NuNatural‘s new Oat Fiber. It has zero calories but adds fiber to any recipe. Since I normally add fiber to my smoothies by way of a couple handfuls of greens, I decided the oat fiber was a great way to add that extra bit of fiber. 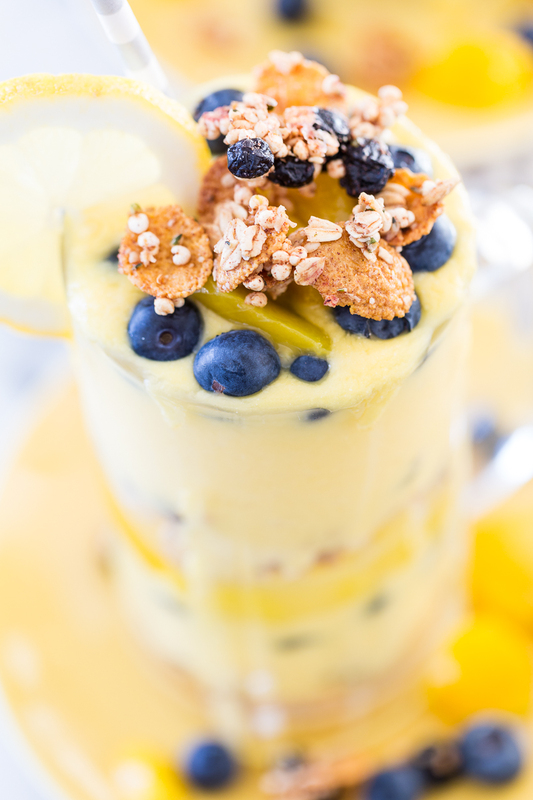 To make this a full-fledged breakfast, I decided to make a parfait with my sweet and tart mango lemonade smoothies. 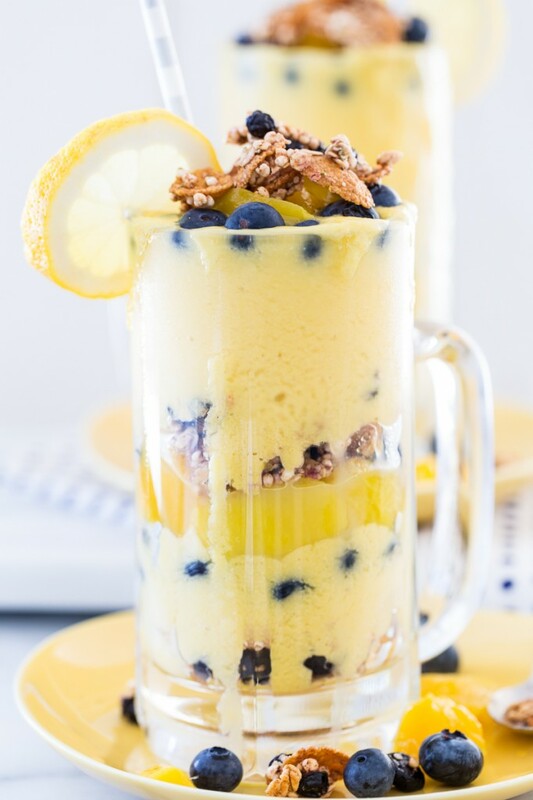 I layered it with blueberries, chopped mango, and Lemon Blueberry Granola for a bright, refreshing breakfast that was perfect after my morning workout. And I had zero puckering-induced headaches or crazy sugar-highs so it was definitely a “Win” in my book. Combine all of the smoothie ingredients in a blender and blend until smooth. In 2 jars or glasses, add about 1/4 cup of granola. Divide half of the smoothie between the 2 containers. Add a layer of blueberries and then a layer of chopped mango. Add another 1/4 cup of granola and the divide the remainder of the smoothie between the two glasses. 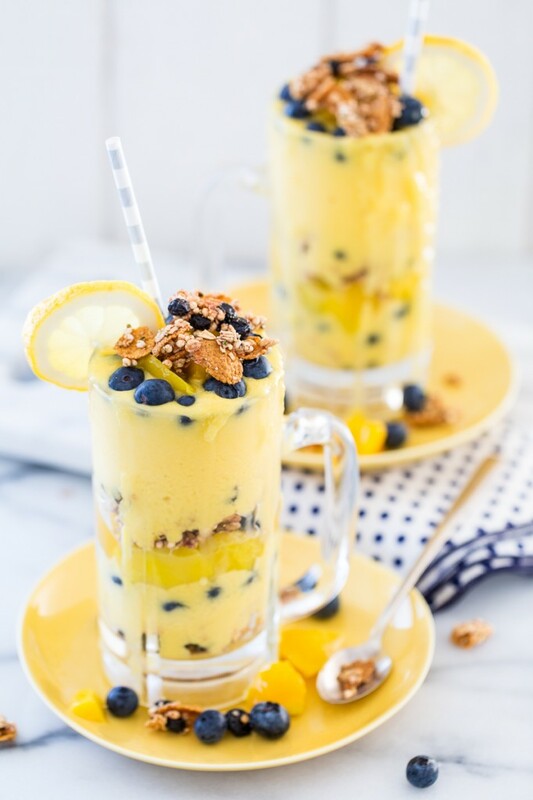 Top with more blueberries, mango, and granola. Serve immediately. Enjoy! NuNaturals has not only been kind enough to let me sample these products, but they’re letting me giveaway a NuNaturals prize pack containing one bottle each of the Lemon, Cherry Vanilla, and Peppermint Flavored Stevia Liquids, PLUS a 50 packet box of NuStevia White Stevia Powder packets, AND a FREE Bonus Product! The whole package retails for over $50. And if that wasn’t great enough, I get to pick 4 WINNERS and the giveaway is open to all of my readers, worldwide! The giveaway will run until 11:59pm on 4/23/14. Please use the box below to enter. Thank you so much to NuNaturals for letting me try these products and for hosting the very generous giveaway. Thank you to all of you for stopping by! Do you use alternative sweeteners? What is your favorite way to use them? Disclaimer: I was given these products to try but the thoughts and opinions expressed here are my own. 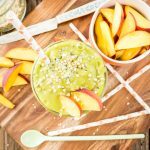 91 Responses to "Mango Lemonade Smoothie Parfait + A GIVEAWAY!" 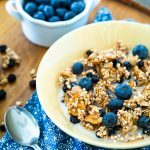 I often use a little stevia in my smoothies, and in my homemade granola. I add stevia to unsweetened flax milk. I like to use stevia in my tea. I love alternative sweeteners! Maple syrup is definitely my favorite. 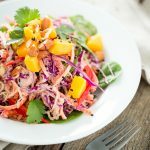 Ali @ Farmers Market Vegan recently posted…Check Out my Segment on the Latest “Our Hen House” Podcast Episode! I like using them in my baked goods. My go-to is stevia, though I have a hard time baking with it when I replace sugar with it; I can’t seem to get the ratio right! And if I’m not using my own spliquid made from my own stevia plant, NuNaturals is my top choice! I always have packets in my purse. This looks utterly divine! I recently received some Nunaturals products to try too so will definitely give this a go when I get home to my kitchen in a few weeks. Coconut sugar, coconut nectar and stevia are my favourite sweeteners. I don’t react well to xylitol…. Just bought my first bottle of stevia… we’ll see how it goes! I’ll use stevia every once in a while in drinks or baked goods. I use maple syrup and agave nectar and stevia as natural sweeteners. I always use Nu Naturals Stevia packets for my coffee! I use Stevia for my tea and coffee, also in smoothies. I love adding stevia in smoothies and baked goods. In my homemade milks, my morning chai tea, my homemade vegan ice creams and any baking I do! What a delicious looking smoothie! I love ones that don’t use banana- love the idea of adding to oat fibre, I bet it helps it get all nice and thick! What a wonderful creation! it sounds delicious and SOOOO much better than lemonade! What a wonderful creation! and sooo much better than regular old lemonade! I generally just use agave as a sweetener, but my mom Looooves stevia! Wow this looks so refreshing yet decadent too. Like a breakfast dessert! Those are my favorite kinds of breakfast 🙂 I use mostly stevia in baking, oats or smoothies. I can’t really handle the strange aftertaste with coffee or tea so I love honey in tea, plus it’s the best cure for a sore throat. I use alternative sweeteners like xylotol because it is actually good for your teeth. I use Spry mints throughout the day at work. I use stevia in drinks, and coconut and date sugars in pretty much everything else. I have to admit to maple syrup in things like oatmeal or breakfast quinoa, because it’s my absolute favorite! I used to use Sweet and Low but quickly realized that it made me feel like absolute garbage (surprise, surprise). Since then I’ve mostly weaned myself off of all sweeteners, but there are times when I still wish for a little something sweet (usually when I’ve made a smoothie with fruit that isn’t at its peak). I’ve never used Stevia based sweeteners but I’d definitely be curious to give them a try, and the flavor element makes them even more appealing! I use maple syrup, agave nectar and coconut sugar when I bake in place of refined sugars. Have wanted to try the NuNaturals because I’ve heard so many good things about them. Thanks for the chance to win some. I love using stevia in all the tea I drink! I’ve also started using it in smoothies lately. NuNaturals is my favorite! I use is in oatmeal, tea, coffee, and chia pudding, among other things. I wish it wasn’t so expensive, but it’s really just the best 🙂 Thank you so much for the giveaway! I do enjoy using alternative sweeteners. I am working really hard to cut sugar out of my life! I like to use maple syrup or agave in baked goods. I’d love to try NuNaturals! I love stevia. I also use maple syrup. I would love to try the different stevia flavors! I use stevia in everything…from coffee to tofu pudding. I like using stevia and agave. My favorite way to use them is in tea, I love tea! Gaaahhhh…Now I’m really jonesing for summer with all that lovely lemon color and mango flavor! And YAYYY for NuNaturals! I’ve tried a few other sweeteners but have yet to find anything that sticks. I use stevia all the time! I use them in my beverages for homemade lemonade as well as iced tea. Sometimes I use stevia in my oatmeal, so I don’t start the day off with a sugar-rush (and the fall afterwards). I have only tried their plain, so new flavors could be interesting! The only “alternative” sweetener that I use is stevia. I use it in a lot of ways, but one of the ways I use it most frequently is in my apple cider vinegar drinks. ACV + lemon juice + water + a few drops of liquid stevia. I try to stay away from refined sugar as much as possible. I udder maple syrup, coconut sugar, and Stevie, although I don’t tend to like the aftertaste, so I’d be excited to try Nu Naturals!!! I am loving the bright Spring colors in your photos lately! I use lots of different sweeteners. I use maple syrup, brown rice syrup, coconut sugar, etc. I love maple syrup with my oatmeal in the morning. I’m a bit new to the stevia drops, but I’ve been using a peppermint one lately that has definitely added something extra to my smoothies (especially chocolate/mocha)! I have not used stevia much in my food. I have only used the powder in banana ice cream in the Vitamix. I would love to learn about stevia drops! Your recipe looks quite enticing! (As do all your recipes!) I’ve made and loved many, many of your delicious dishes. Thank you Christy! Wow, Kristy – these photos are totally mouthwatering! 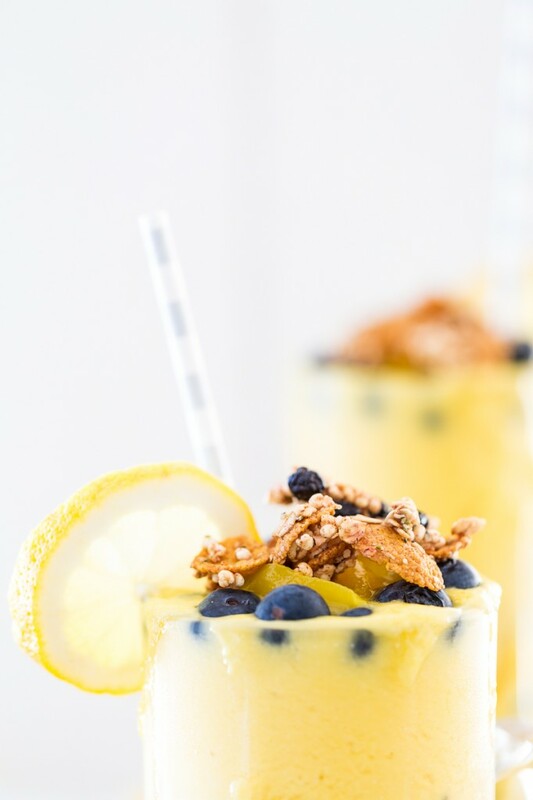 I love the idea of a lemonade smoothie and the combination of lemon, mango, and blueberries (plus granola!) just sounds incredible! I’ve never used stevia though I’ve heard a lot about NuNaturals and would love to try flavouring homemade yoghurt with their liquid flavours. I adore coconut sugar despite the price tag, but sometimes granulated sweeteners aren’t quite right! I mostly use a liquid stevia in my coffee and tea. I will occasionally use xylitol. Ahh looks so delicious! I just had dinner but now I’m feeling hungry again! I love stevia in my cinnamon oatmeal! I love stevia and would like to try the different flavors. I always put maple syrup in my oatmeal! I use stevia once in a while in smoothies or other things, but I like maple syrup in bakery, etc. I use stevia for most of my daily sweetener needs, but i also love using dates, maple syrup, and xylitol for baking and other desserts! This smoothie looks SO good that I’m going to march downstairs right now and make one for myself! I do not normally use alternative sweeteners, however I am sensitive to sugar and I really need to watch my intake. I would LOVE to try these nunaturals stevia sweeteners! I like to use stevia in my baked goods. Thank you for the giveaway. 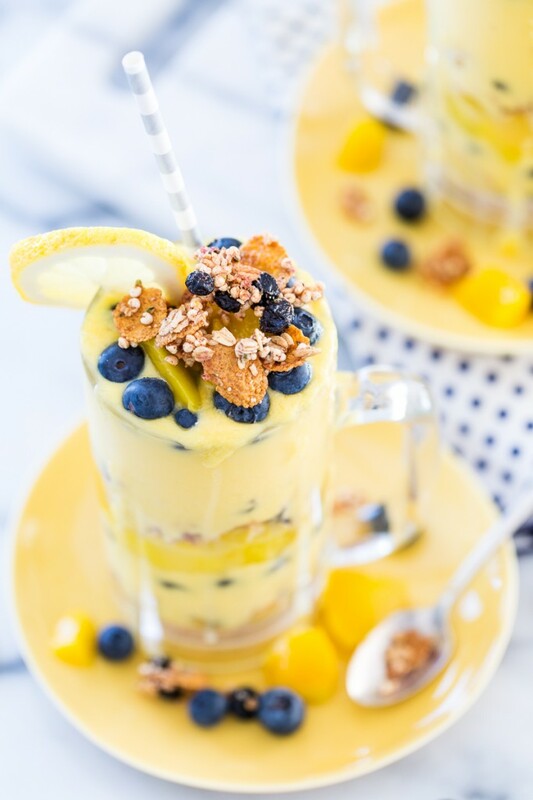 sa collins recently posted…Mango Lemonade Smoothie Parfait + A GIVEAWAY! I Use stevia in all my recipes that i used to put sugar in , i also use it in my smoothies ans iced tea.. I Use stevia in all my recipes that i used to put sugar in , i also use it in my smoothies and iced tea.. I like a lot of the alternative sweeteners out there. I like to use different ones for different types of foods and recipes. I really like agave or maple syrup in coffee and use stevia for oatmeal and chai tea. I also love the mild flavor of brown rice syrup and use it in baking a lot. I’ve never used the NuNaturals brand of stevia and would love to try it! I use maple syrup in my smoothies and stevia powder in my baking. Love the idea of flavoured stevia. I adore the taste of agave. I use it when I make cashew ice cream! I like to add just a little liquid stevia to almond milk before I make my oatmeal with it! I love to use alternative sweeteners. 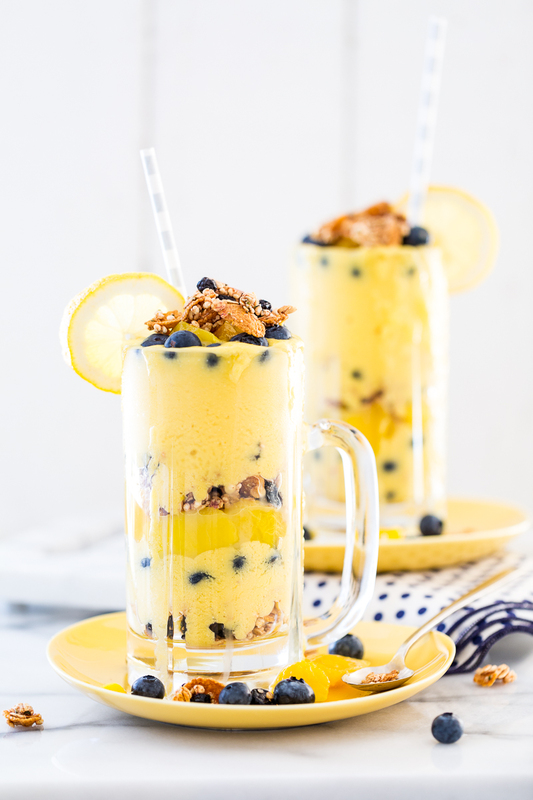 From my tea to pancakes to smoothie bowls, they are now catching on with my family! I pretty much just use Stevia in coffee drinks, haven’t tried it in baked goods yet. I’ve been making cookies with dates as the sweetener! So good. That and maple syrup are my go to sweeteners. I would love to try stevia, have only tried one kind and it was just so-so. Some things I felt there was an aftertaste, others none! I like to add a few drops of stevia to my hot cocoa which is almond milk, peppermint extract and cocoa powder. The peppermint stevia drops would be so perfect for this! Oh my goodness this looks so delicious!! I love mangos so this will be right up my ally. I use stevia in my tea! I often use sweeteners in my hot drinks (coffee and tea), in my morning bowl of oatmeal, and in smoothies! I made a sugar-free birthday cake for a friend with stevia–it was yummo! 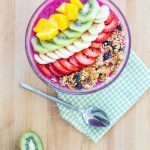 I have always wanted to use alternative sweeteners, especially in the acai bowls I learned how to make from your blog. Unfortunately, they can be pretty expensive and I am on a college student budget! I have not used them, but I would love to use the winnings to try them out! Michelle recently posted…Been a while! I use vanilla stevia drops in my coffee! So yummy! I would love to try these products especially the lemon flavour! This smoothie looks so delicious!